édité le 26/05/2017 - Plus de news de "Wood" - Voir la fiche entreprise de "Wood"
Hess Corporation has signed a non-exclusive 10-year global agreement with Wood Group to provide engineering, project management, construction, commissioning, operations & maintenance, integrity management, subsea, and decommissioning services. 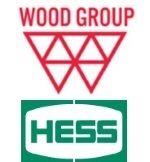 Robin Watson, Wood Group chief executive, said, "This agreement further solidifies the strong relationship we have with Hess. The ability to consolidate the full breadth of our services under one agreement offers an exceptional level of continuity to Hess and all our clients. "We look forward to many more years of working together with Hess as we unlock our combined potential to create more efficiencies through innovation. We share the same operational excellence mindset and fully expect to achieve meaningful progress in safety, performance and cost savings."